278 pages | 19 B/W Illus. This book concludes a trilogy that began with Intelligent Cities: Innovation, Knowledge Systems and digital spaces (Routledge 2002) and Intelligent Cities and Globalisation of Innovation Networks (Routledge 2008). Together these books examine intelligent cities as environments of innovation and collaborative problem-solving. In this final book, the focus is on planning, strategy and governance of intelligent cities. Divided into three parts, each section elaborates upon complementary aspects of intelligent city strategy and planning. Part I is about the drivers and architectures of the spatial intelligence of cities, while Part II turns to planning processes and discusses top-down and bottom-up planning for intelligent cities. Cities such as Amsterdam, Manchester, Stockholm and Helsinki are examples of cities that have used bottom-up planning through the gradual implementation of successive initiatives for regeneration. On the other hand, Living PlanIT, Neapolis in Cyprus, and Saudi Arabia intelligent cities have started with the top-down approach, setting up urban operating systems and common central platforms. Part III focuses on intelligent city strategies; how cities should manage the drivers of spatial intelligence, create smart environments, mobilise communities, and offer new solutions to address city problems. Main findings of the book are related to a series of models which capture fundamental aspects of intelligent cities making and operation. These models consider structure, function, planning, strategies toward intelligent environments and a model of governance based on mobilisation of communities, knowledge architectures, and innovation cycles. The Age of Intelligent Cities book trilogy is truly a magnificent piece of work with conceptual and empirical elements interwoven to produce the emerging fabric and thread for 21st century theories, policies and practices related to and focusing on how more than two out of three of humans live, work, play and hopefully survive and prosper: in the small, medium and mega-size urban centers on planet earth. Science, technology, innovation and entrepreneurship empowered by knowledge and creativity are the essential elements of the intelligent cities of the future and will thus define and shape the age we are entering following the information revolution age: this is the age of the smart city and this book will serve as our intellectual compass to navigate our way towards an era where hopefully "technological intelligence" will be in harmony with and accompanied by human, social and political enlightenment. Professor Elias G. Carayannis, George Washington University, USA. 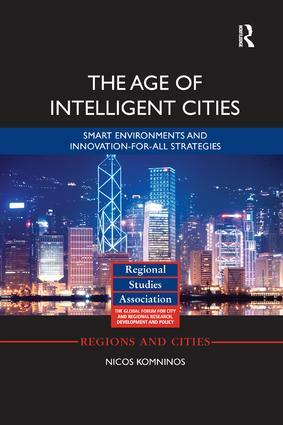 The Age of Intelligent Cities provides a comprehensive view of the shaping of urban intelligent environments. The way it outlines technological trends and puts them into a wider context is unsurpassed. The book is universal in scope, well arranged, and insightful, providing tools for understanding and planning intelligent cities. It is a definitive landmark that deserves to gain a wide readership and a must for both academics and practitioners concerned with our urban future. Professor Ari-Veikko Anttiroiko, University of Tampere, Finland. Nearly all of texts published so far on intelligent cities and smart environments are edited books, capturing the state-of-the-art within the field. Sole authored books written to push beyond this and force a step change in understanding and knowledge are rare. So it is a particular pleasure to come across one written by an academic of standing, who bases their representation of the ongoing debate over intelligent cities and smart environments on the findings of successful research projects. As a result, the singular insights this book on intelligent cities offers are turnkey and allow much of the material already published on smart environments to be integrated as part of an overarching and authoritative narrative. Professor Mark Deakin, Edinburgh Napier University, UK. Nicos Komninos is Professor of Urban Development and Innovation Policy at the Aristotle University of Thessaloniki, Greece.